This book was EXPLOSIVE. 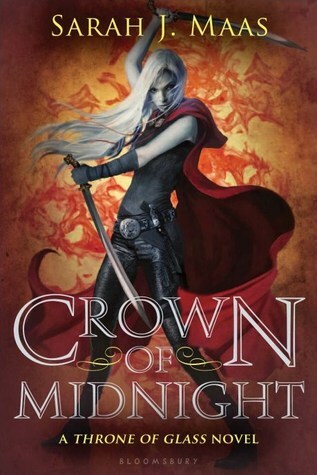 I absolutely loved Throne of Glass and I was a little afraid of reading Crown of Midnight. Usually when I love a first book, the second can be awful and even a little boring. There was absolutely no boring moments in Crown of Midnight. It was exciting, heartbreaking and hands down the most shocking book I have read in a long time. A lot of the twists and turns I didn't expect and Celaena's story goes far deeper than I first realized. I appreciate that the author doesn't reveal all of her secrets immediately- there are parts at the end of the book where I was gaping and thinking, "What in the world?" Celaena finally gets to be in love and be happy in Crown of Midnight... well sort of. I don't want to ruin any parts of the plot, but I will put it this way- the author is pretty unmerciful when it comes to Celaena. Even after reading the book, I feel like I need to read it again to catch everything- there was so much! A ton of new characters are introduced, and some of our old favorite characters are killed. This is a brutal, passionate tale where noone is safe or left untouched. Crown of Midnight is an electrifying and stunning sequel. I cannot wait to read the third book- I don't know how I am going to be able to wait for a year! Great review! I, too, simply ADORED this novel. Maas is one of the best authors I've read in a long time. I felt so bad for Celaena and one of the guys. The situations just broke my heart. I can understand her anger, but I think she overreacted because she's so protective of herself. I hope things work out better for her in the next installment. I can't wait for book 3 either.